SOUTH BEND, Ind. (AP) — After routing Iowa, Arike Ogunbowale and No. 1 Notre Dame can now turn their attention to their showdown Sunday with No. 2 UConn. 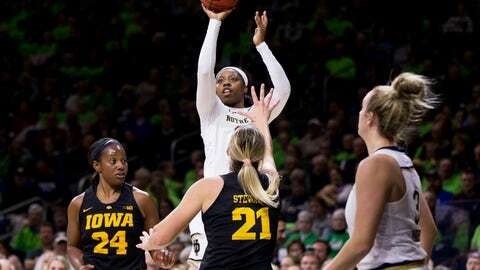 “It’s one of the best rivalries in college basketball,” said Ogunbowale after she scored 30 points and her fellow starters all finished in double figures as the Irish routed 14th-ranked Hawkeyes 105-71 on Thursday night. “When we play like that and play together, we’re really unstoppable,” Ogunbowale said after shooting 13-of-21 from the field against the Hawkeyes. For most of the game, McGraw employed a 2-3 zone, trying to front Gustafson with the 6-foot-3 Turner with the 6-4 Shepard behind her. It was Turner’s block of Gustafson early in the third quarter that ended the Iowa center’s 14-for-14 effort over a game and a half and got the Irish rolling. Iowa: The Hawkeyes, coming off a 71-67 loss to Florida State in the championship of the Junkanoo Jam in the Bahamas, started five players who were averaging in double figures, led by the 6-3 Gustafson, the Big Ten’s preseason player of the year. Gustafson, who was 8-for-8 against the Seminoles, made her first six shots against Notre Dame before Turner blocked her first shot of the second half. She finished 11-of-16 from the field in the game and is now 53-of-67 in her last five games. Notre Dame: The Irish had a 23-19 edge on the boards in the first half with the Turner grabbing seven and Shepard hauling in six. Twelve of Notre Dame’s rebounds in the first half came on the offensive boards — seven total by Turner and Shepard — with Notre Dame outscoring Iowa 14-6 on second-chance points. For the game, the Irish had 25 offensive boards and outscored the Hawkeyes 32-12 on second-chance shots. Mabrey finished with 18 points in just over 23 minutes of action, hitting 6-of-13 from the field including 3-of-9 from beyond the 3-point line. She also contributed five of Notre Dame’s 21 assists, one less than Young, and had two steals, one less than Shepard. Notre Dame, which used a six-player rotation during last season’s run to the NCAA title because of four season-ending ACL injuries, had 10 of its 11 scholarship players healthy at the start. Freshman point guard Jordan Nixon, who started the first three games in place of Mabrey, missed her fourth straight game recovering from a concussion she suffered at DePaul Nov. 17. But during the third quarter, freshman guard Katlyn Gilbert, playing with a harness on her right shoulder, left the court after her shoulder popped out. She’s doubtful for the Huskies.